The STM is a drive + motor + control unit, fusing step motor, drive, and controller technologies into a single device, offering savings on space, wiring and cost over conventional motor and drive solutions. The "S" models offer control options such as step and direction, analog input, joystick control, and host commands using the Si Command Language (SCL). SCL allows for control via serial commands sent from a host device such as a PC or PLC. This permits the user to perform a variety of motion, I/O, and system status tasks in real time via a host serial device. The"Q" and "IP" models add the capability of stand-alone programmable operation using the "Q" text-based programming language. This language offers high-level features such as multi-tasking, conditional programming, math functions, register access, and much more. 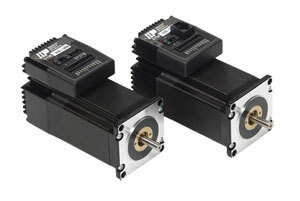 All of the STM models offer RS232 and RS485 versions, as well as the option of a 1000-line encoder that is integrated into the motor housing. The encoder option provides stall detection and prevention; the controller senses rotor lag and reduces speed to avoid stalling. Models are available with 85 oz-in up to 340 oz-in torque. STM23 models also offer Ethernet and Ethernet/IP versions. At power-up the drive diagnoses mis-wires and detects any open or shorted motor phases. The drive smoothes the low-speed torque ripple which is inherent in all step motor systems. Command Signal Smoothing can soften the effect of immediate changes in velocity and direction, making the motion of the motor less jerky. Step motor systems resonate at certain speeds. The STM drive + motor automatically calculates the system’s natural frequency and applies damping to the control algorithm. The ELC-PH12NNDT model PLC provides high-speed pulse outputs which can be used to drive any of Omega's step & direction stepper drives. The ELCSoft ladder logic software has built-in step motor functions which make programming your motion control application easy. The STM23S-2AN is an integrated stepper drive + stepper motor which accepts pulses from a PLC. Add the ELCSoft programming software, ELC-CBPCELC1 programming cable, and OMPS150A24 power supply for a complete motion-control system that costs less than $1000. 참고: Power supply is required (sold separately). Comes complete with software and download cable.